Ever since I discovered Geechie Boy Mill grits at an event at Art & Soul, I’ve been obsessed with them. They are not only great to make traditional grits, they are wonderful in cornbread too. Geechie Boy Mill grits are made by Greg Johnsman from sweet heirloom corn. The grits have a deep corn flavor, and just in 30 minutes of cooking time they get to the perfect texture. 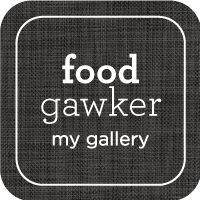 I like grits that are tender, but not mushy. I want to be able get the mouth feel of each tender grain. I add milk to get them even more creamy and firm, almost custard like. Honestly, they are just as good cooked in water with a bit of salt. As the grits cook, their aroma will perfume your kitchen and you won’t believe that grits could have such a robust fragrance. If you have any leftover grits, heat them up with a little milk and serve with a fried egg on top for breakfast. 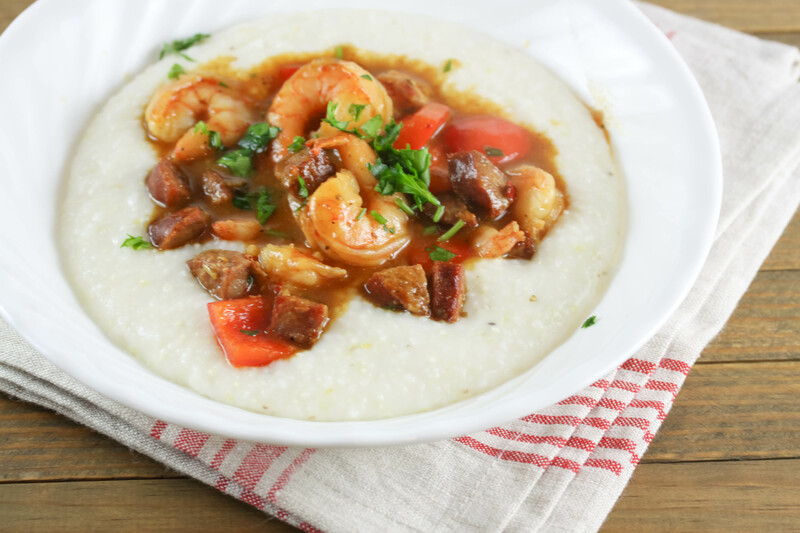 The shrimp in the silky sauce are savory, spicy, and luscious but, for me, the grits are the unsung hero of the dish. Cook your grits in water, and 1 teaspoon salt, according to package directions. 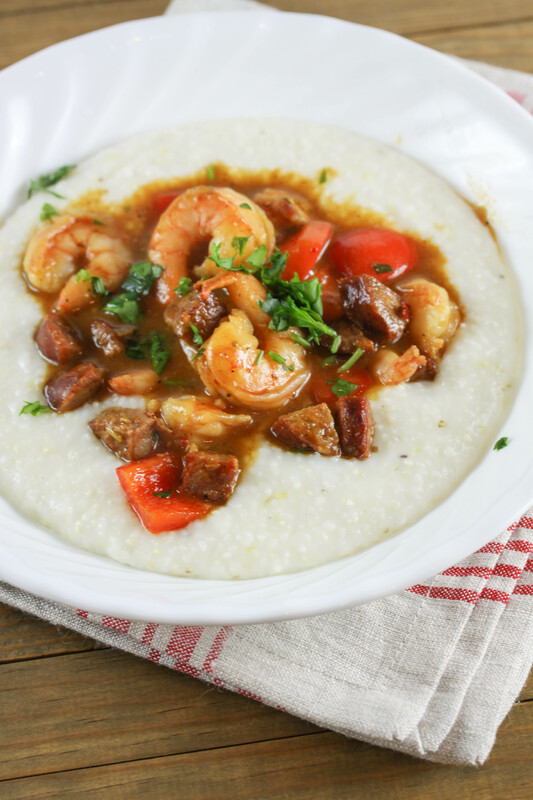 Once your grits are done to your desired texture, add the milk and simmer for about 5 minutes, stirring frequently. Add the cheeses, and mix well until they have melted. Taste, and add more salt if necessary. Peel and de-vein the shrimp, reserving the shells. Season the shrimp with a couple of pinches of salt and pepper, garlic, red pepper flakes, fennel, lemon juice, and olive oil. Cover and refrigerate until ready to use. In a small pot, add the shells, cover, and bring to a simmer. Simmer on low for about 15 minutes. Strain the shells and reserve the liquid. Place a large, shallow, pot (I use cast iron) over medium heat. Add the sausage. Once the sausage is brown and has released some fat, add the red bell pepper and cook for about 2 minutes. Remove the sausage and pepper from the pot and put in a bowl, set aside. Now add the shrimp and cook until they are pink, do not over cook. Remove from the pot, and add to the bowl with the sausage and pepper, set aside. Add 1.5 tablespoons butter or oil to the pot, and add the flour. [If your sausage released a lot of oil, and you already have about 1.5 tablespoons of fat in the pot, you might not need to add the butter or oil.] Cook until dark brown over low heat. Add the tomato paste and stir well. Add the white wine and whisk constantly, then add the reserved chicken stock/shrimp shell liquid. Whisk for 2-5 minutes, until thickened and silky. Add the sausage, red bell pepper, and shrimp back to the pot to heat through with the sauce. Taste and season with salt and pepper as necessary. Plate the grits, and then spoon over the shrimp and sauce mixture over the top. Garnish with parsley. Serve with hot sauce on the side. Serves 4-6. Prev Pumpkin Meringue Pie, Need I Say More?